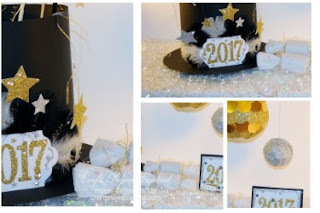 Just Julie B's Stampin' Space: Elegant New Year Party Ensemble! You can ring in the New Year in style with this Elegant New Year Party Ensemble! The festive Top Hat Centerpiece will bring an element of celebration to your party décor, while the dangling glitter balls add a touch of elegance. The easy to assemble party poppers will be enjoyed by adults and children alike when the clock strikes twelve! Finish off this ensemble with a fun shaker card that can be used as an invitation to or to send a note to welcome in the New Year. This super fabulous project was made by Julie Warnick, and you can get her tutorial when you subscribe to the month of December over at Craft Project Central.